Photo © 2015 FOX. All Rights Reserved. Photo by Jessica Miglio © 2015 FOX. All Rights Reserved. Image © 2015 FOX. All Rights Reserved. 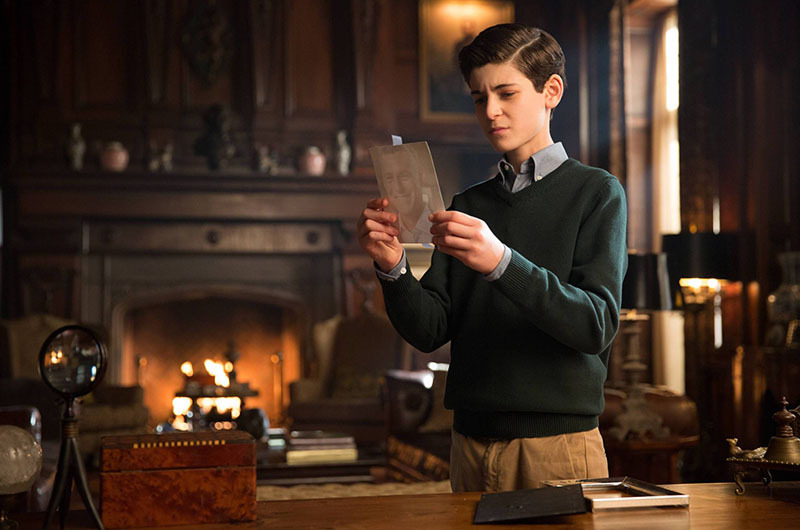 Galavan [James Frain] meets with Bruce Wayne [David Mazouz]. Photo by Nicole Rivelli © 2015 FOX. All Rights Reserved. 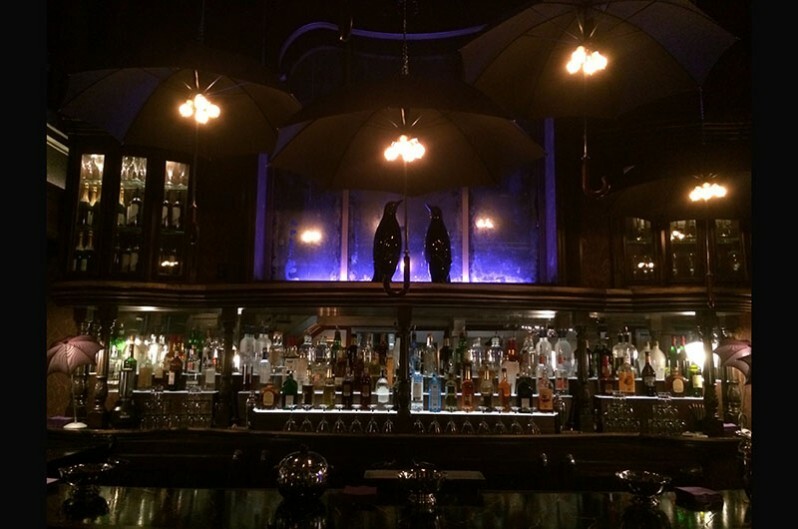 The Penguin, Oswald Cobblepot has taken over Fish Malone’s, transforming it into his eponymous nightclub. GOTHAM presents an elegant, raw yet sophisticated origin story of the great DC Comics super-villains and vigilantes, revealing the circumstances that created the larger-than-life personas who would become Catwoman, The Penguin, The Riddler, Two-Face, Poison Ivy, The Joker and other nefarious members of the underworld…plus the crime world’s greatest foes, James Gordon, an idealistic city detective who eventually becomes Gotham’s Police Commissioner, and the young Bruce Wayne, who secretly evolves into the iconic superhero Batman. As befits this fantastical crime drama, the sets offer an enhanced reality, the visuals alone are worth watching this breakout series! 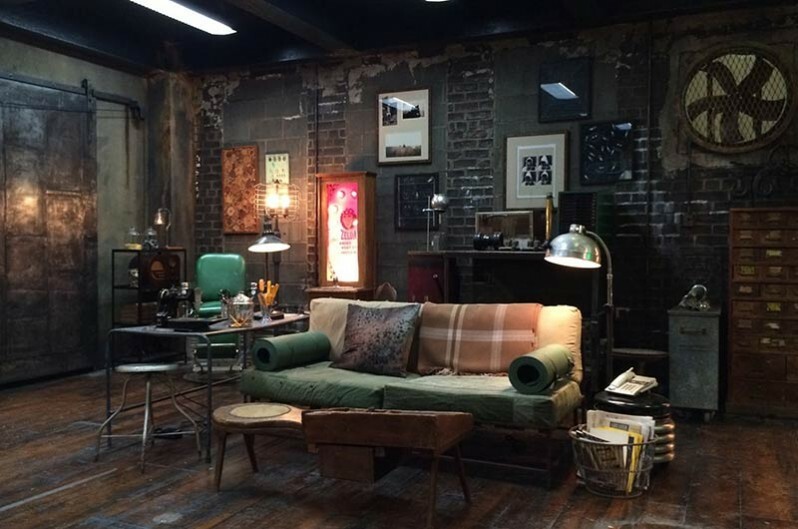 Set Decorator Andrew Baseman SDSA stepped away for a few moments from the production of the second season to give us an overview of the first* and a hint of the new! SET DECOR: So many of the single-frame shots from this series could become a photographic exhibition, they have such a graphic presence, a momentary painting. This is the Director of Photography taking advantage of the incredible sets you and the PD have offered. Your lighting and lamp selections are fantastic! 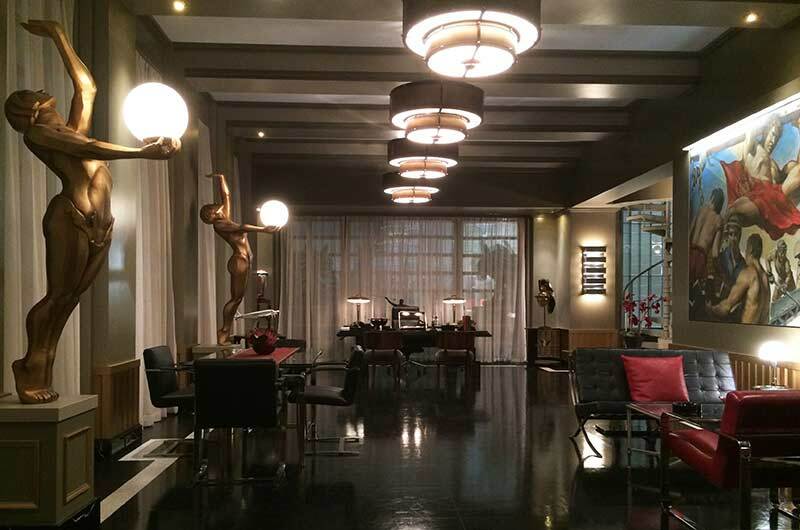 Set Decorator Andrew Baseman SDSA: Not sure why but I’ve always loved vintage lighting. As a teenager I worked in my parent’s antiques shop restoring and refinishing furniture, where I also learned how to rewire lamps. When we bought our weekend home in Upstate NY, it was a good excuse to use some of my favorite lamps, including my grandmother’s figural ceramic bird table lamp. It originally had a fussy pleated silk shade but when I tossed it out and added a black paper shade, it was transformed into something more modern. 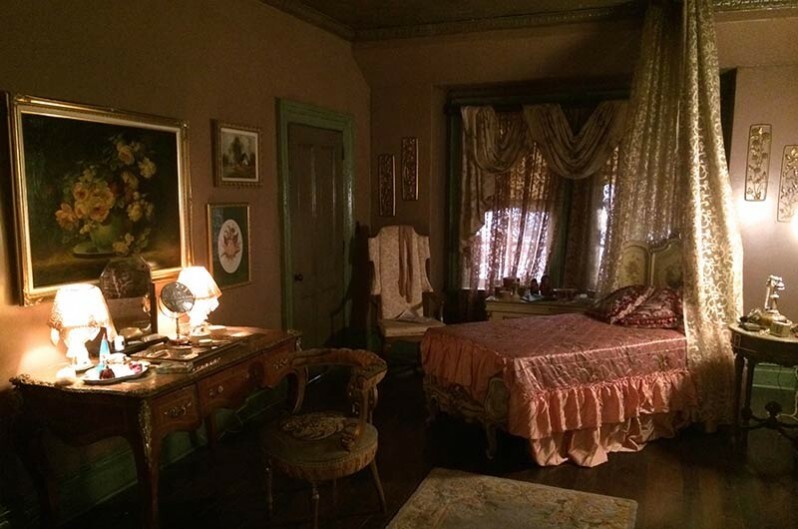 Regarding set decoration, adding the right lamp to a set is crucial, for it not only helps to tell the story of a character, it actually illuminates the character, both figuratively and literally. With the onset of sophisticated digital cameras, the lamps I provide in many cases are the only light source, so it is important to have an open dialogue with the DP and give them what they need. The conversation I have with the production designer, who shares his opinions on the style of lamps needed, and the gaffers, who request specific types of bulbs, begins on the tech scout. Once we all agree on the style, my resourceful assistant Ashley Wellbrock and I start the search for the appropriate fixtures. 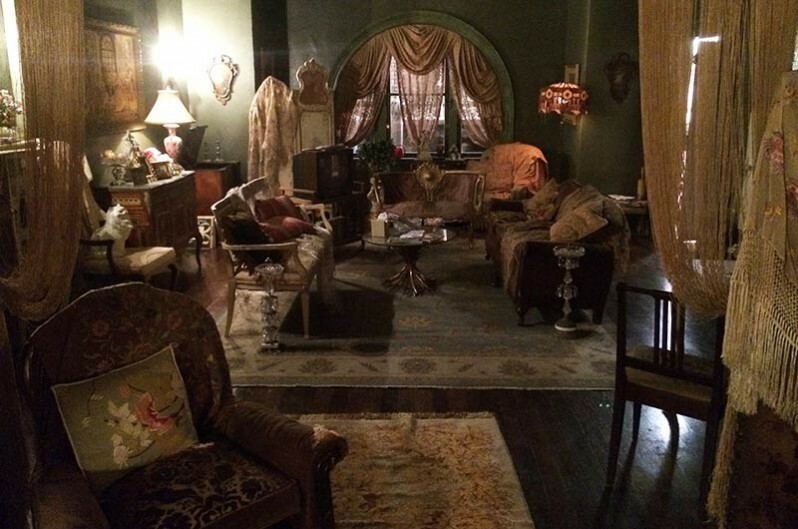 In episodic television where there is seldom a long lead-time in procuring set dressing, we need to be flexible and have a few different options to present. I try to have a sizable stock of lamps on hand for every production I am decorating. 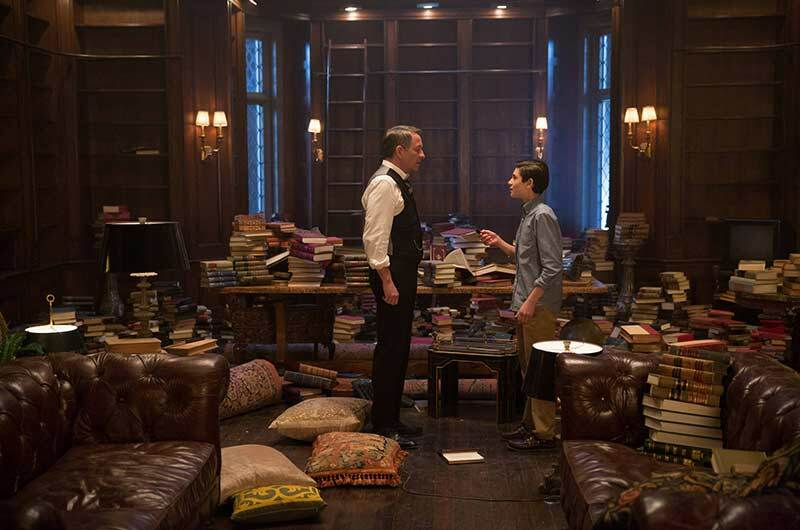 Lamps are one of the few set dressing items that are needed in almost every scene, so with that in mind, I pay close attention to every detail, making sure they are kept in good working order. I keep a supply of various harp and shade sizes. And don’t underestimate the importance of the right finial, which can act as the proverbial cherry on top of the sundae! For the latter, I found artificial taper and column candles so realistic that even up close, members of the cast and crew were stunned to discover that they were not real. I also like using wall sconces and adjustable recessed ceiling fixtures to help define the architecture of the space, while washing the walls with a nice glow. SET DECOR: There’s a stylized quality without losing the realism in this fantasy series…almost an operatic quality to the sets. Would you care to comment on this? 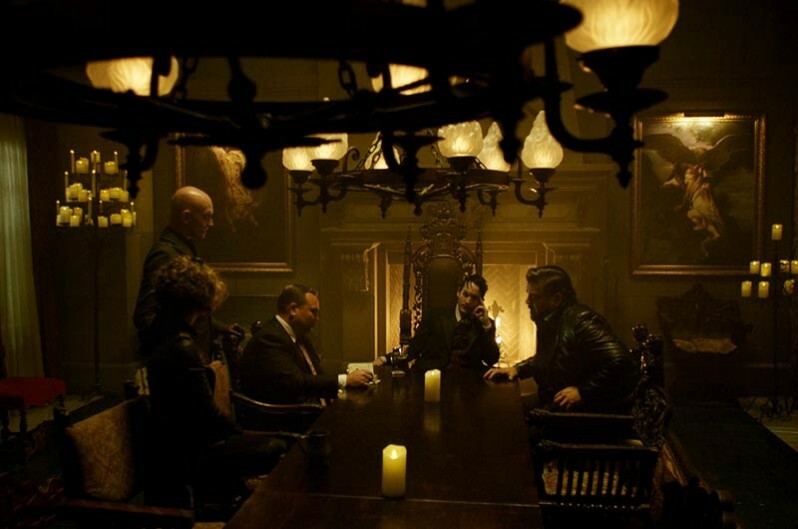 AB: The sets on GOTHAM are larger than life, with an operatic feel to them in keeping with the over-the-top characters whose tales we are helping to tell. The tight color palettes range from rich jewel tones of deep red, purple and gold, to sickly green, ochre and gray. We seldom, if ever, use light or pastel tones. As the scale of the sets and locations are grand, the camera angles are often low and shooting upward, which accentuates the height. Reflections are important to the look of the show, so floors are often polished and exterior streets are wet down to allow for reflections. For interior sets, I add glass tops to furniture surfaces to optimize depth. 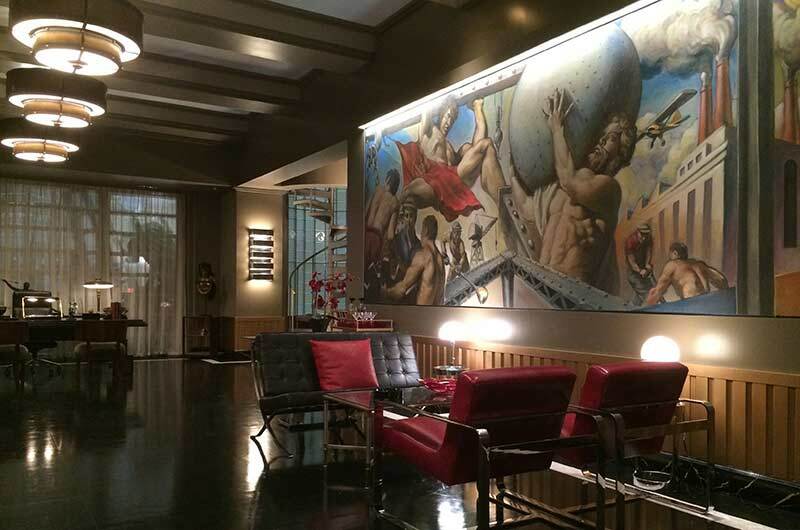 SET DECOR: Whereas the show is set in a non-defined contemporary time, there also seems to very fittingly be a design nod to the 1930s-1940s, which was the era in which the BATMAN comics actually began. I enjoy mixing in all periods, but hover somewhere between the 1940s to the early 1980s. 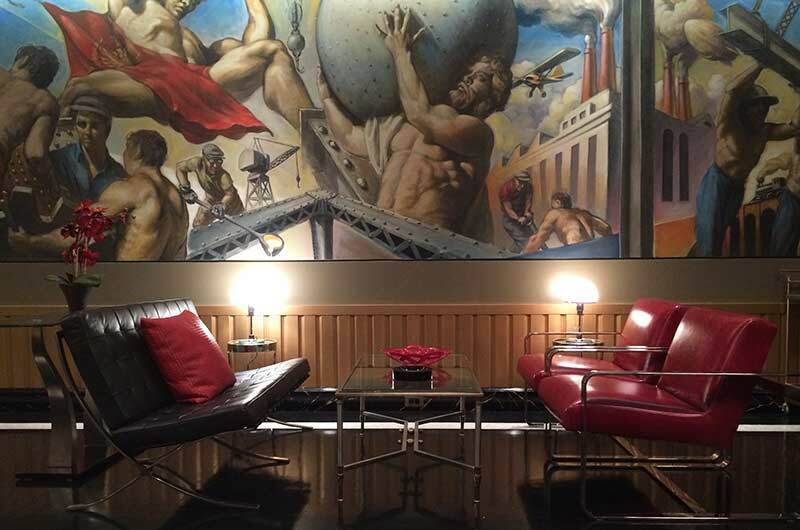 As much as I love decorating with classic antiques, as in the Wayne Manor Study, I have loved Art Deco since I was a teenager and was thrilled to fill Gallavan’s Penthouse with authentic pieces from the 1930s. Many of the interiors include a mash-up of styles but I try hard not to include anything considered trendy by today’s standards. 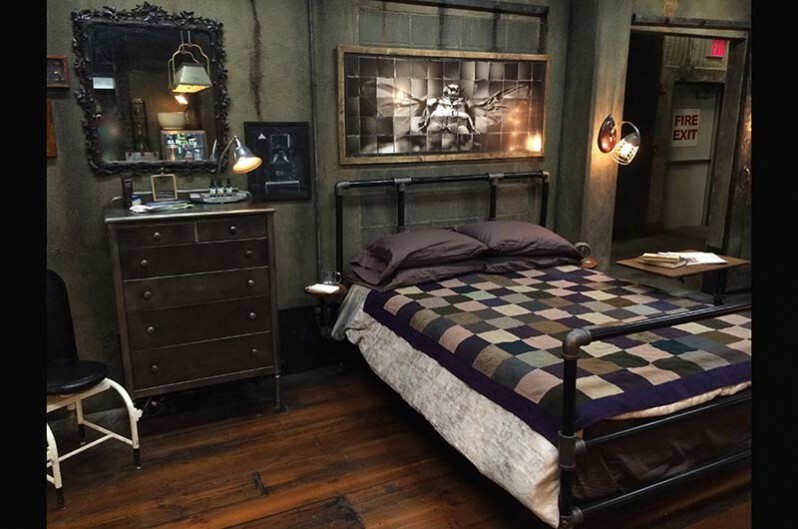 SET DECOR: People love discovering both the hidden and the not-so-subtle homages or clues to character and story. Could you reveal some of these elements? 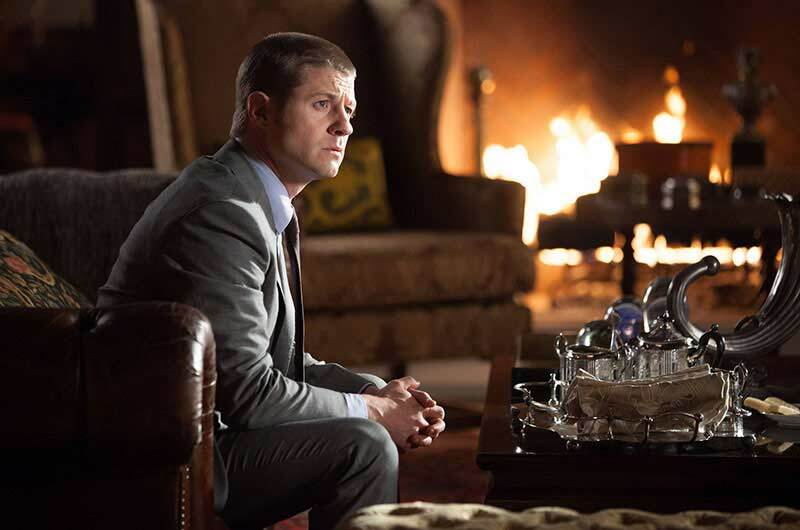 AB: As a big fan of the original BATMAN television series from the 1960s, I wanted to not only pay homage but also to add a few clues to who these characters would become. 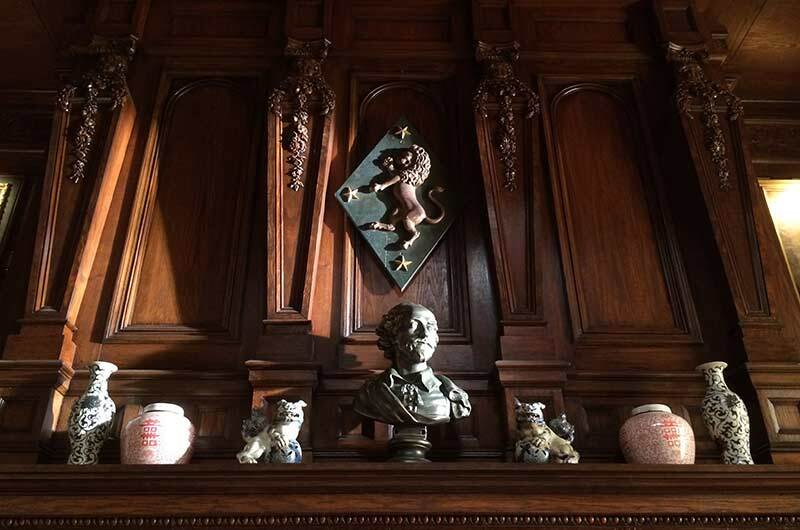 The most obvious examples are in the Wayne Manor Study, where I have added a suit of armor and a bust of Shakespeare in direct homage, as well as more subtle clues such as books on bats and framed antique bat engravings. 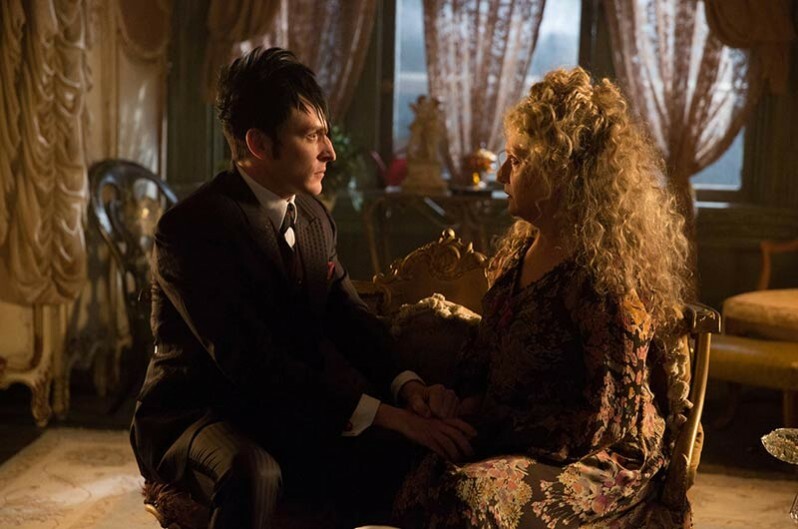 Other examples of character foreshadowing include a small porcelain penguin figure in Mrs. Cobblepot’s curio cabinet…she happens to be his mother. 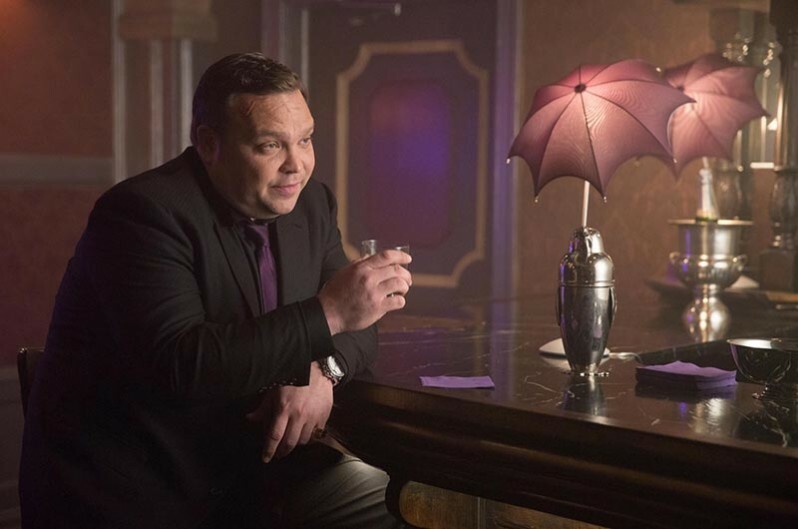 In Penguin’s nightclub, Oswald’s, I had fun making lamps from umbrellas, the first time we saw the iconic accessory associate with the character. 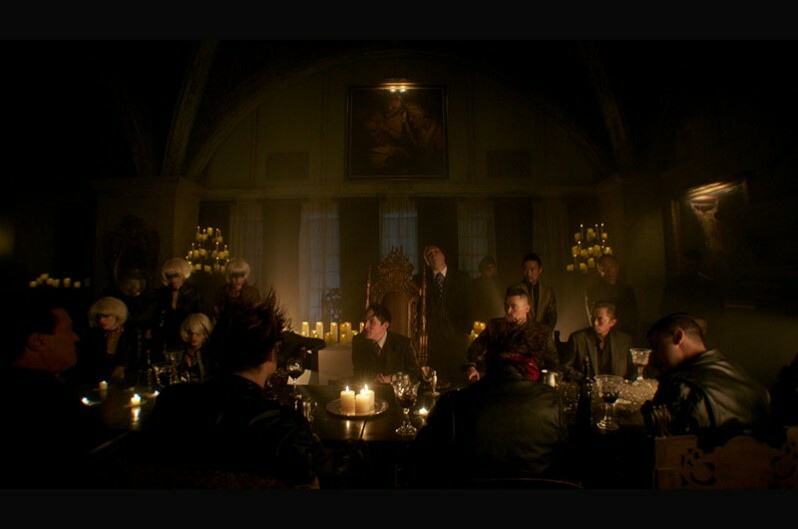 AB: I had a lot of fun transforming Fish Mooney’s Nightclub into Oswald’s. Naturally, I had very little time to get the work done, and ended up choosing many of the items based on how fast we could get them delivered! 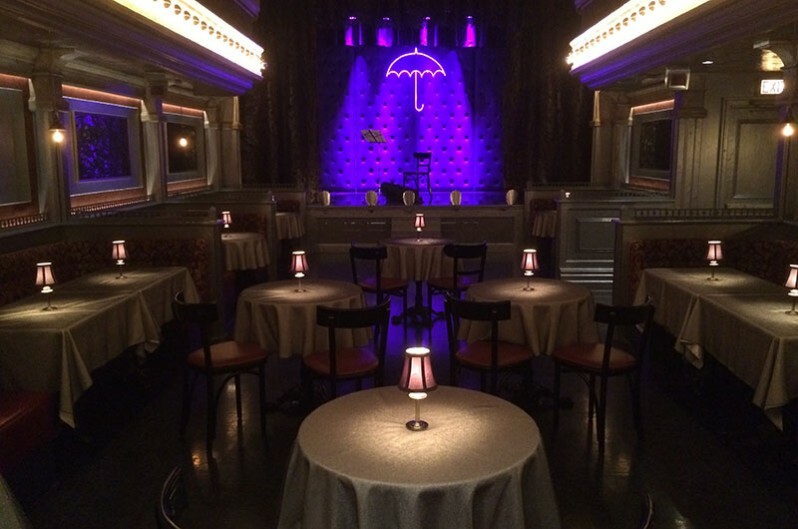 So in a matter of days, we removed all of the crystal lamps, antique gilt mirrors and red tufted-leather, and replaced it with steam-punk pewter-colored lighting, umbrella lamps and purple accents. 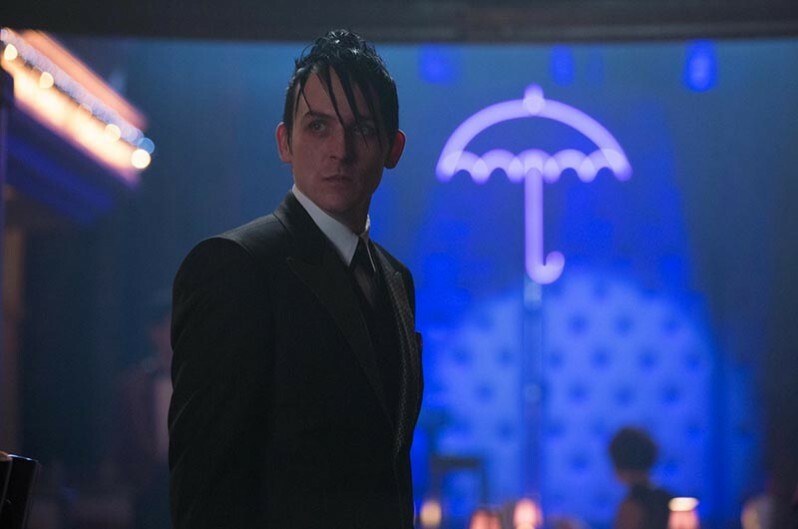 Fish Mooney’s iconic fish skeleton sign was replaced with a neon umbrella, the first time we see Penguin’s ubiquitous symbol. 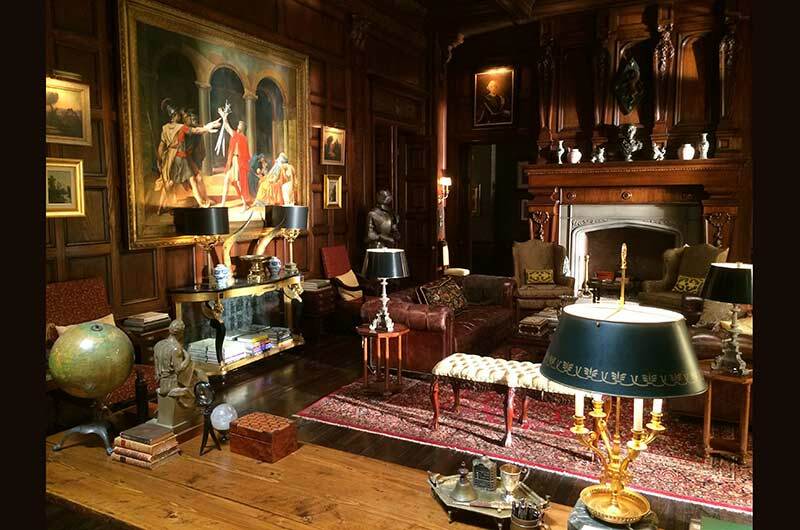 SET DECOR: You grew up in the antiques world and have obviously maintained a passion for them, which comes through in the depth of the sets’ furnishings…a practiced eye seamlessly mixing and blending periods. Can you describe this a little for us? 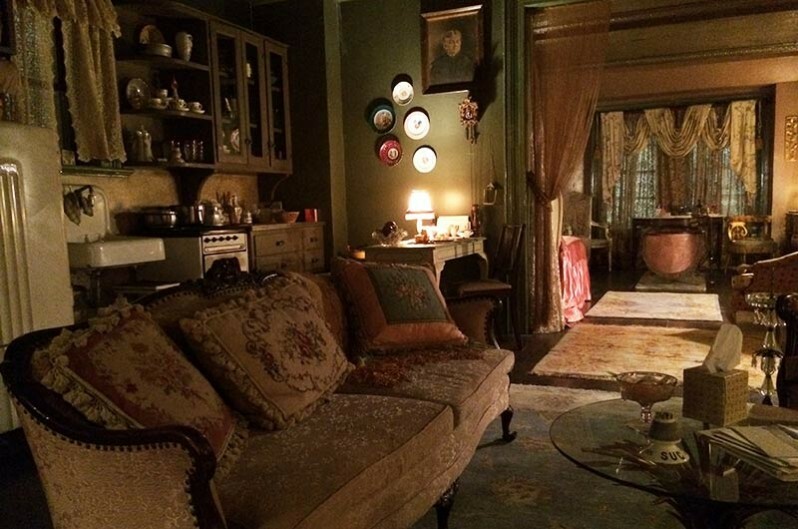 AB: With a background in antiques, I try to dress the sets with as many unique and interesting pieces as I can find. I have a hard time shopping at places that carry antique reproductions because they never quite look right and are often the same price, if not more expensive, than the originals. Older items also have a patina from years of use. Sometimes I will go to one of my favorite local antiques shops without expectation and am often pleasantly surprised at what I stumble upon. Often times the script does not have a clear description of the character’s surroundings, so I need to come up with a backstory to add depth. When appropriate, I like giving characters collections of things, which can range from a shelf full of brass nautical items to a collection of teapots. Nothing pleases me more than when I see an actor enter their set for the first time, look around with a smile on their face and tell me how much they like the details I added. SET DECOR: Your passion particularly includes, as noted in your blog PAST IMPERFECT, the art of inventive repair. Pieces that might have been discarded, instead creatively repaired, often combined with unrelated materials and becoming re-creations of a sort. Please tell us about this, and your blog! 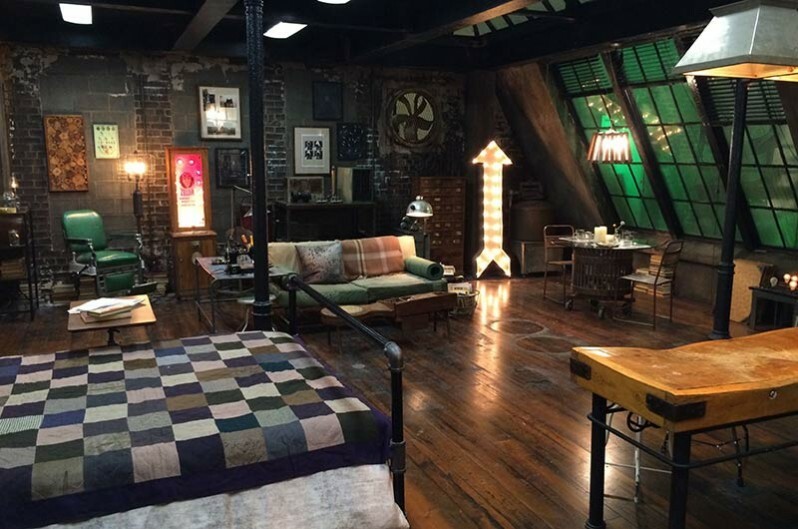 SET DECOR: That can translate to many of the characters in Gotham City. Would you care to journey this road and describe a few…and set elements that reflect them? 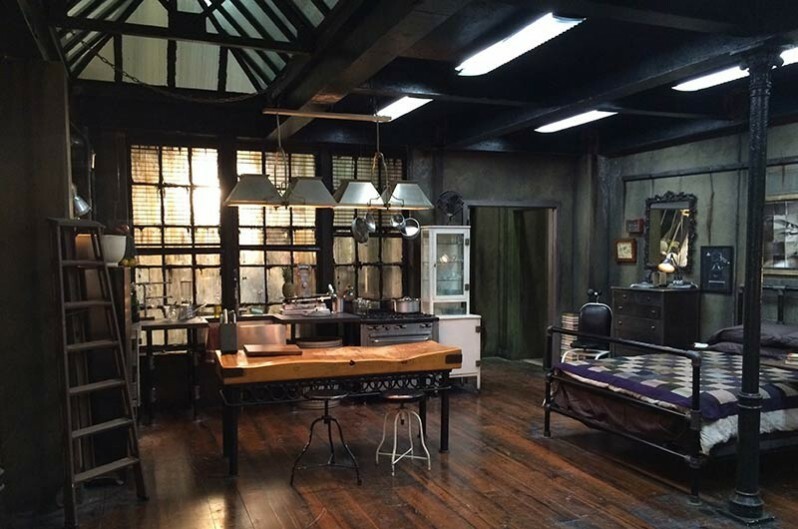 AB: I use many imperfect pieces in my sets and Gotham has many “broken” characters where imperfection best suits them. Mrs. Cobblepot, by virtue of her name alone, allowed me to fill her kitchen cabinet with broken, chipped and mismatched “cobbled pots”, all thrown together! I haven’t decorated Penguin’s home yet, but when I do, you can be sure it will be filled with some crazy broken and/or repaired things. SET DECOR: You’ve written about collecting, in your aforementioned blog, plus the book THE SCARF. Detail is obviously important to you. 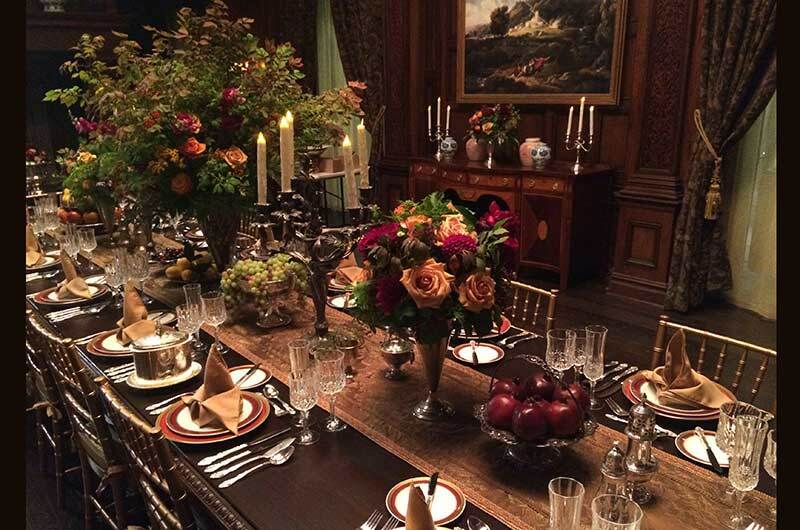 Would you care to comment about how the experience of serious collecting has enhanced your set decoration? AB: To say I am detail oriented is a bit of an understatement. Just ask my crew, who will tell you that I sometimes drive them crazy. But when I ask for things that some would consider unnecessary or superfluous, I tell them why I want them and explain how they might be featured in the shot. And at times when I ask for something and I see eyes begin to roll, I will bring in a still shot the next morning from the dallies, showing the seemingly unimportant item in close-up! In collecting, I have learned to continually upgrade my collection by adding only the best examples I can find and get rid of the mediocre. I find that I use certain pieces of set dressing over and over again, while others I neglect and will most likely never use them. As we have limited storage space, I need to keep only the best examples that I know I will use frequently and get rid of the ones I am unlikely to use. 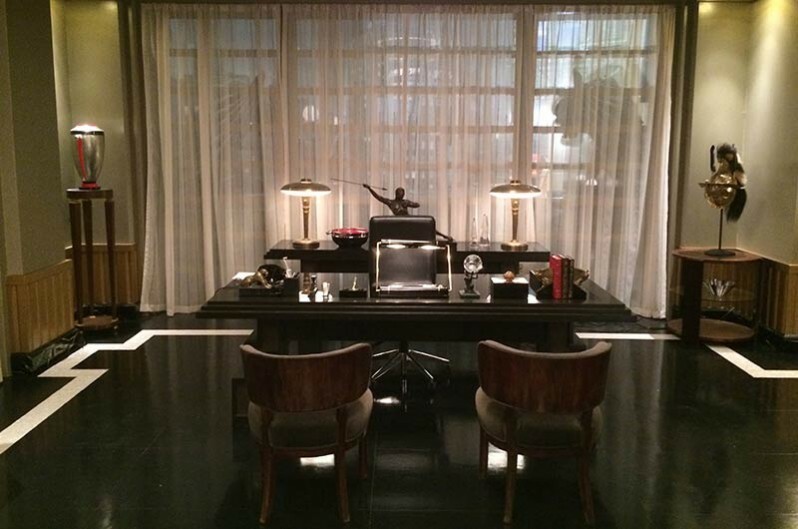 SET DECOR: Well that leads to…please tell us some of your favorite sets or set elements in this series! 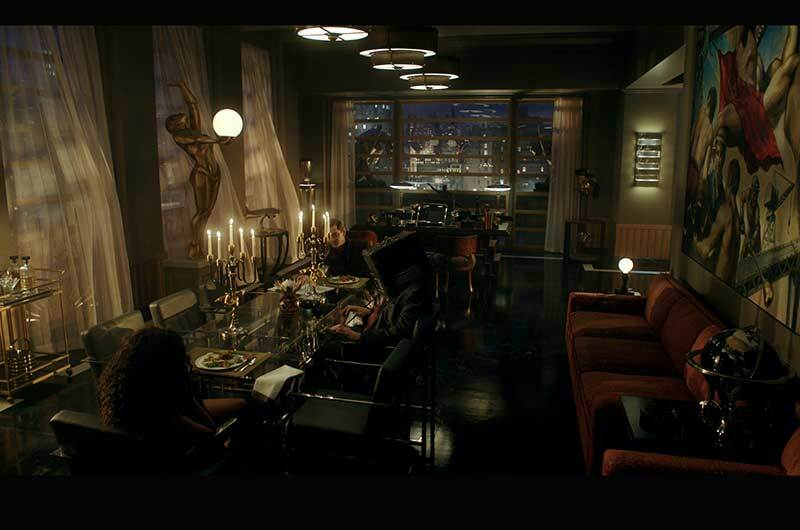 AB: My favorite new set is the slick Art Deco penthouse we created for Galavan, a new villain in this upcoming Season 2. I love the use of the perpetually polished shiny black floor, along with the deep rich upholstery fabrics and leather, using deep red as an accent color. Our production designer, Richard Berg, designed a pair of gorgeous life-size sculptural female form lamps that add richness and grandeur to the room. Other elements include an elegant spiral staircase, custom fireplace mantle and multiple enormous hanging lamps. 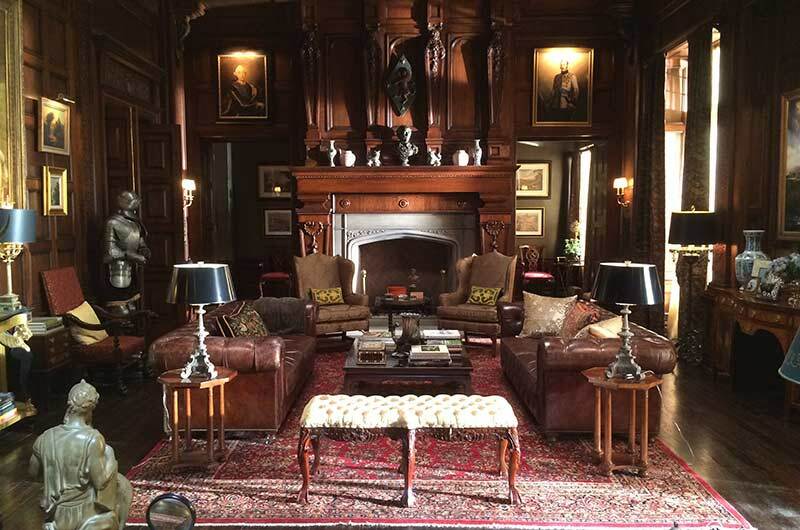 For Season 1, I loved decorating the Wayne Manor Study, which I filled with antique furniture, artwork, Oriental rugs, and hundreds of leather bound books. 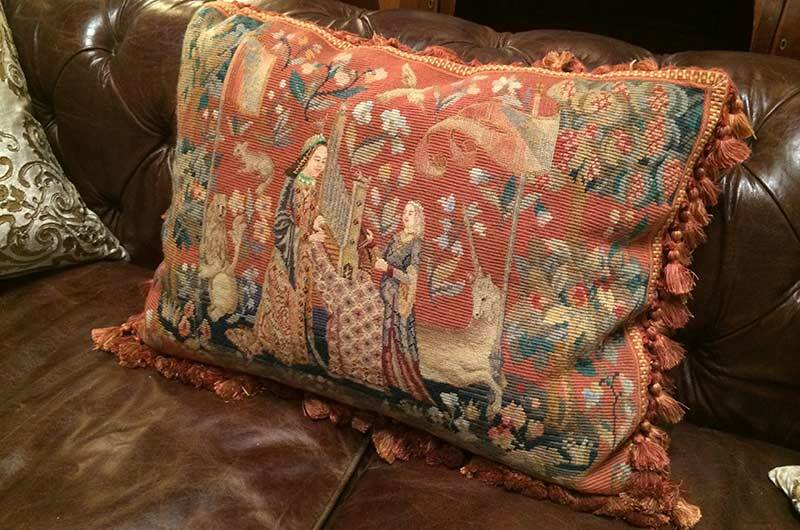 I think my favorite element in the room is a large antique sofa pillow I had made from an unfinished needlepoint depicting a Renaissance scene. The colors and details are exquisite and include ladies, flags, trees, flowers and a unicorn. SET DECOR: Are there SDSA business members you particularly use? 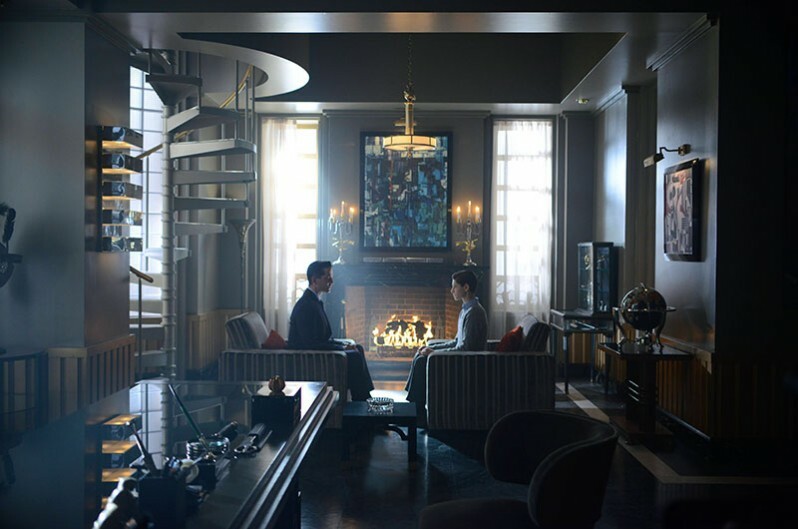 Set Decorator Regina Graves SDSA and Production Designer Doug Kraner were nominated for an Emmy ® for the pilot, Episode 1 of GOTHAM. Baseman took over the reins on Episode 2 and has held them firmly in grasp throughout the series production, including 21 episodes of Season 1. Kraner stayed on as PD through Episode 9, then handed over to Richard Berg. 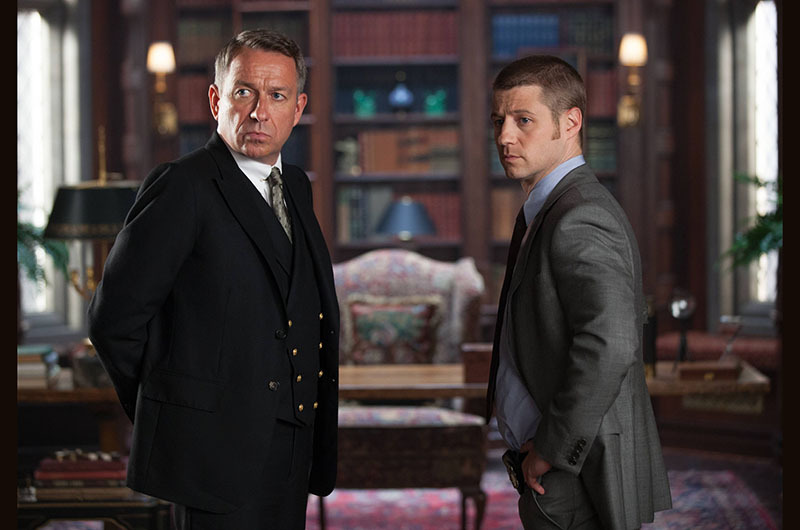 Baseman and Berg are currently collaborating on Season 2.